The perfect addition to any everyday ensemble, this fun and dapper Dr. Seuss Cat in the Hat Striped Bow Tie features the Cat character from the Dr. Seuss story The Cat in the Hat. The left side of the bowtie is black and white striped with an illustration of the Cat while the right side of the bow tie is red with, "The Cat in the Hat," lettering in darker red. 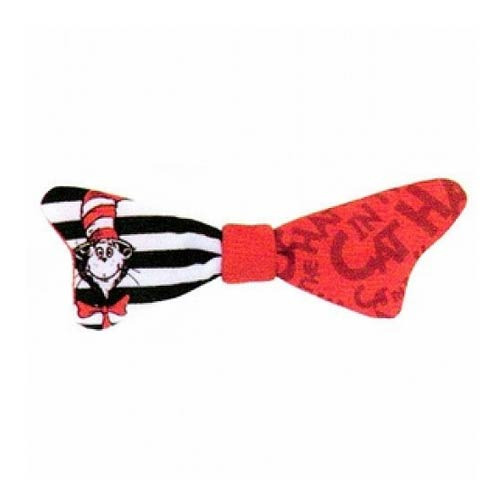 The Dr. Seuss Cat in the Hat Striped Bow Tie secures around the neck with a piece of white elastic. Measures approximately 6 1/4-inches long. Fits ages 3 and up.